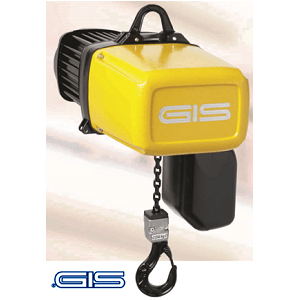 GIS have been manufacturing electric chain hoist for over 50 years, and continuously keep up with the latest technological advances. 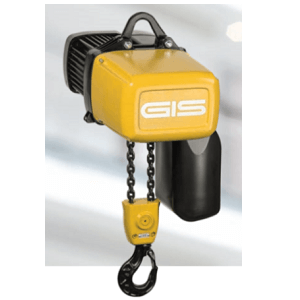 This means that GIS electric hoists are constantly evolving to ensure you get the highest productivity from these electric hoists. Other factors at the forefront of development are safety, longevity, ease of use, easy maintenance and repairs and versatility. 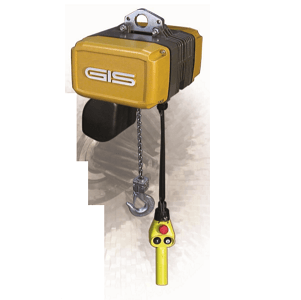 GIS manufacture the highly efficient GCH electric chain hoist and have been since 2005. The GCH is a popular hoist which has been produced since 2005 and is used across a wide range of industries, and the range includes many models with lifting capacities ranging from 250kg up to 2500kg, though has a good range of duty classification options which may higher the SWL. The GP range has special models with lifting capacities up to 2500kg. The GIS GP Special Products include Atex rated models, Corrosion resistant versions, single phase options and handy tool options as well as hoists for use with wind turbines and for use in the entertainment industries. Whichever model you choose you can be assured of the highest quality and a hoist with the latest technological advances. Lifting Hoists Direct can supply the range of GIS electric hoists at competitive prices, we also offer full back-up services including 24 hour engineers for breakdown problems, servicing, repairs and thorough inspections.